Gerry Lang was serving a 65-year sentence even before the Commission Case began. Gennaro Langella, a former high-ranking member of the Colombo family, died on Sunday at the US Medical Center for Prisons in Missouri. Langella was convicted of a grab bag of mob-related crimes, but foremost among them was that he'd been in the administration of a Mafia crime family: underboss of New York’s Colombo borgata, one of the most strife-ridden families in all of the Mafia. Many Colombo members are related by blood. They also are among the most violent-prone of the five New York families, having been forged by three inter-family wars, two of which involved the Gallo brothers, and the third, Victor "Little Vic" Orena, a designated acting boss who tried to assume power. During the trial, Langella was found guilty alongside seven other Mafiosi. Also convicted was Langella’s Colombo crime family boss -- the already incarcerated Carmine "The Snake" Persico, who defended himself at the trial (unintentionally providing much-needed comic relief in the process). Prosecutors convinced the jury that eight defendants were members of the “Commission” that was in place to oversee all Mafia business in the United States since the early 1930s. The trial lasted 10 weeks, and all defendants were found guilty in November 1986. The following year, seven of them, including Langella, were sentenced to 100 years in prison for their crimes. Rudy Giuliani, in his pre-mayoral days, as U.S. Attorney prosecuted them -- and not without at least an iota of regret, based on two interviews he participated in in recent years. According to The Independent: Langella was born in December of 1938 to first generation immigrant parents from the Campania region of Italy (where the Camorra now holds sway). 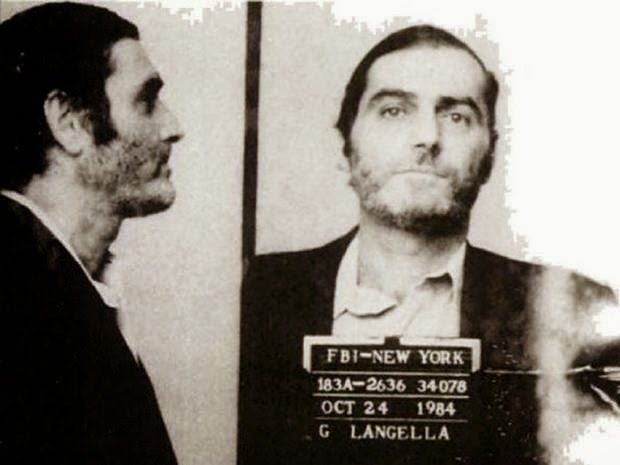 Growing up in Carroll Gardens area of New York, Langella was a close associate of his cousin and future boss Persico, who was five years his senior and already leader of the Garfield Boys (later renamed the South Brooklyn Boys) – a teenage street gang that terrorized New York’s Bensonhurst neighborhood. Langella was officially “made” into the Colombo crime family in early 1976 and quickly climbed the ranks thanks to his close relationship with Persico, acting on his boss’ behalf when Persico was jailed in the early 1970s and again in the early 1980s. He was later named the Colombo's official underboss. Before the Mafia Commission Trial, Langella had been sentenced to 65 years in prison in another racketeering prosecution and was serving time with the Commission Case began. Langella’s funeral will be held on Saturday morning in Brooklyn. The Colombos are the only New York family not named after its progenitor, Joe Profaci. The Olive Oil King, as he was known, had left behind a mess that included an ongoing feud with the Gallos. Also, Profaci underboss Joseph Magliocco took over, but the succession plan did not receive Commission approval. Magliocco, his face slapped, accepted an offer from Joseph "Joe Bananas" Bonanno to help him carry out an audacious plot to seize control of all New York rackets by assassinating Carlo Gambino, Thomas Lucchese and Buffalo boss Stefano Magaddino, who was powerful enough to have earned his own seat on the Commission. Magliocco contracted his top hit man to pull off the hits. Joe Colombo may have lacked judgment later in his life, but when given those orders, he blew the whistle -- showing fealty to the Commission, he revealed the entire plot to Don Carlo. Colombo was then named boss, and the Profaci family redubbed the Colombo family. Nice Story! Great Site! How come there aren't any stories on crazy joe gallo?? Because Joe Gallo is a horse that's been beaten to death!!!! Garfield Place is in Park Sope, the South Brooklyn Boys were based out of Red Hook neither have anything to do with Bensonhurst!!!!!!!! I'm not too fond of this guy. He once took a house on Staten Island from somebody that couldn't pay the vig on a loan. The guy who couldn't pay begged Gerry Lang if he could clear out the house of his and his family's belongings before turning over possession. Gerry Lang flat out told him "No." Business is business the house should have went to Lang, but at least let the guy get his stuff for himself and his kids. As for Joey Gallo, he would turn on you in a heartbeat. The Blast was on okay guy. But in the end, there are no friends in this business.